A new approach to treating brittle bone disease, a congenital disorder that results in fragile bones that break easily has been unveiled by Baylor College of Medicine researchers. The study, published in the current issue of the journal Nature Medicine, showed that excessive activity of an important signaling protein in the matrix of the bone called transforming growth factor beta is associated with the cause of the disease. Lee said the new study suggested that there may be common mechanisms that cause the decreased quality and quantity of bone in these different forms. Collagen is the most common protein in the human body, and the four most common types are found in different types of tissues including bone, cartilage, blood vessels, and kidney. In animal studies, Lee and his colleagues showed that blockade of the TGF proteins using an antibody could restore the quantity of bone in mice with different forms of brittle bone disease. “This treatment appears even more effective than other existing approaches,” said Lee. There are currently drugs in development to block this pathway in humans, so eventually the work can be translated into human studies, he said. Existing approaches revolve around symptom management such as prevention of bone fractures, physical therapy and bone strengthening drugs, not necessarily medications to target the underlying cause of the disease, he said. 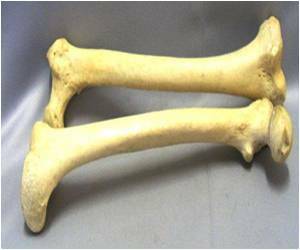 The study is novel because it shows a personalized approach to more effective treatment patients with these forms of brittle bone disease. “We hope this approach will also be useful in more common forms of osteoporosis,” said Lee.